Turn your precious photos into beautiful Photo Crystals. These authentic crystal pieces combine the art of photography with the beauty of crystal. The result is a breath taking translucent photo crystal, sure to be admired by all. Available in 2 sizes. These are 100% genuine crystal. 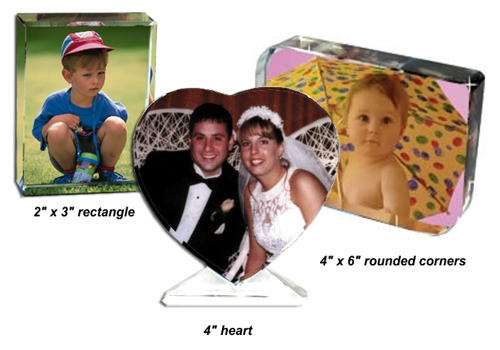 They make a memorable photo gift for Weddings, Anniversaries, Holidays and more. Each piece includes your image optimized and fused to the crystal, and comes custom fitted in a satin lined presentation box. They are simple yet complex, timeless yet immediate and classic yet totally modern.